Order your Graf Von Faber-Castell Classic Anello Grenadilla Rollerball today from FahrneysPens.com. Fine Pens, Refills & Luxurious Gifts – great prices & fast shipping. 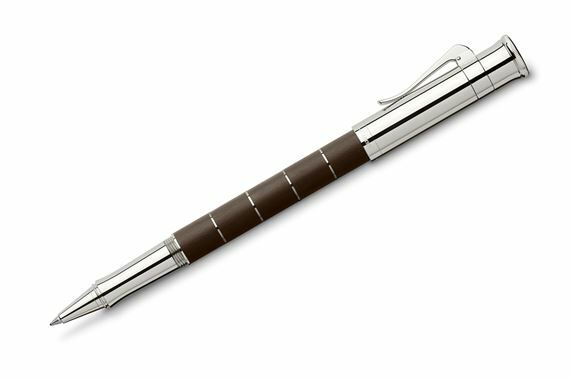 The new Classic Anello series from Graf von Faber-Castell will seduce you the moment you take it in your hand. The Grenadilla wood takes the luxury appeal of the Anello line to new heights. Grenadilla wood segments set with fine, platinum-plated rings in between to form a fascinating contrast on the slender, tapered barrels. The purist look of the writing instruments lend the collection its name – Anello (Italian for “ring”). Perfectly balanced, the Anellos have a pleasantly smooth surface that gives the impression the barrels are made out of one single piece. The fluted metal caps, curved spring-loaded clips and tapered grips are plated in precious platinum. Don’t let the graceful lines and elegant looks fool you – these German-made pens are built for precision and performance. The Anello fountain pen has a superior, two-tone 18K gold nib design that distinguishes it from the ordinary. Equally impressive are the matching capped rollerball, twist ball pen and 0.7mm propelling pencil. The new Anello series runs rings around the competition!